Arranging flowers indoors is a lot like designing a flower bed in the garden. Color, form, and seasonality all come into play. Even if you don't have a flower garden to draw inspiration from, gather some of your favorite flowers from the florist and experiment with the possibilities. 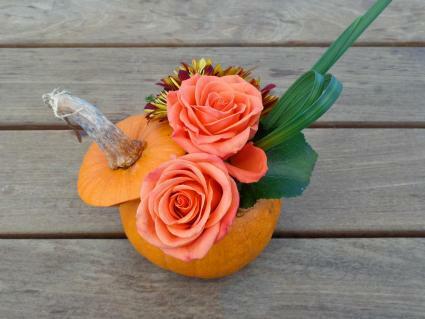 Gathering the right materials is the first step in making a stellar flower arrangement. The best flowers and plants to arrange with are those that last a long time after they are cut. From there, it's a matter of choosing a theme and considering your composition. Do you want something bright and bold or airy and elegant? Is your style formal, rustic, modern or traditional? There are flowers and plants that can express almost any style or sentiment. Consider pleasing color combinations, such as purple and yellow, red and blue, or green and white. Texture is equally important, and is often where foliage comes into play. There are wispy, lacy, hard, spiky, soft, velvety, shiny, rough and many other textures in the plant world to choose from. Like the flowers you choose, the container that holds them should match your personal style. 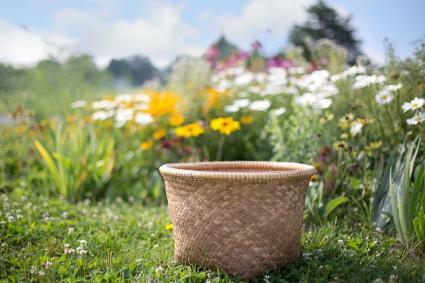 The main requirement is that it holds water, but keep in mind that you can also house a watertight container inside something else, which makes it possible to use things that don't hold water, like wicker baskets, to give a certain look and feel to floral arrangements. Think of the container and flowers as two parts of one composition and make sure the colors, textures and form match. If you're working with tall, thin plant materials, a long elegant vase might be the way to go. 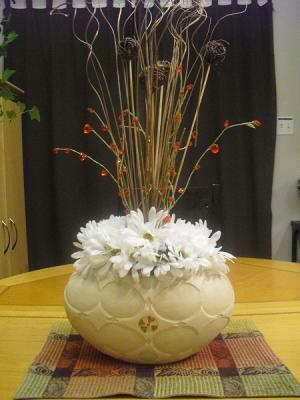 If your flower arrangement is going to be short and round, consider using a wide, shallow bowl to hold it. At a minimum, you'll need scissors to cut the stems to the correct length, but there are other tools and supplies that make things easier and open up a broader array of possibilities. Cutting implements - All-purpose scissors are good for cutting small stems, tape, string, etc., while hand pruners are necessary for larger, woody stems. Floral tape - Floral tape serves a variety of functions, from holding bundles of stems together to holding an anchoring device in place; both clear and green tapes are available. Anchoring devices - There are many devices available that help hold the stems where you want them: floral foams (wettable green substrate for stems) and frogs (grid-like metal devices) provide a structure to keep stems from shifting position; filling the container two-thirds with small pebble or marbles is another way to anchor stems and adds to the composition when used in a clear glass container. Floral preservative - Preservative is a soluble powder that keeps the flowers fresh longer, which is usually provided free-of-charge wherever cut flowers are purchased. When devising a floral arrangement, consider the decor of the room it will go in and the statement you want to make -- romance, quirkiness, happiness, elegance, etc. 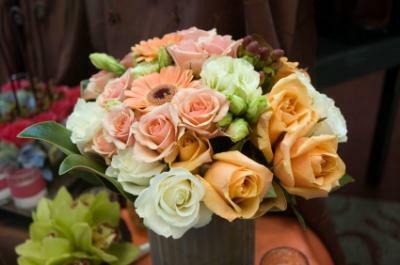 There are no hard-and-fast rules to arranging flowers, but there are few approaches to consider. Above all, consider it a creative endeavor and follow your instincts. Choose one type of large flower as a focal point and support it with several smaller varieties. To keep the arrangement from feeling overly busy, limit the number of types of flowers to three or four varieties with one or two foliage varieties to complement. Use an odd number of the larger flowers --three, five, or seven, spaced evenly around the arrangement. Spaciousness, contrast, and smooth textures are the defining qualities of a modern-looking floral arrangement. Calla lilies, lisianthus, and tulips are some of the flowers that could be used in this context. However, foliage can play a more predominant role in creating a sleek, modernist look; ferns, elephant's ear and ivy vines can be employed for an artistic effect. Glazed ceramic vases are good choices as containers. 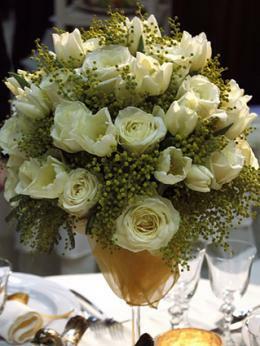 Roses, peonies, and stargazer lilies are a few of the timeless classics for use in floral arrangements. To create a simple, graceful composition, try adding just a single filler, such as baby's breath. An elegant crystal vase would be the perfect container for this type of composition. Daisies, snapdragons, and foxglove are examples of cottage garden flowers that lend themselves to a less-formal composition. Like a cottage garden, this approach can be a bit more diverse. For a boisterous composition, consider adding berries, like those from heavenly bamboo, or large seed heads, like those from pampas grass. Wicker baskets, metal pails, or chipped and faded ceramic urns make an appropriate container for a rustic floral arrangement. This elegant arrangement uses complementary yellow (sunflower) and purple (lisianthus) colors and a unique ceramic container designed to resemble birch bark for a quick, easy, and successful aesthetic composition. The arching variegated stems create a balanced, yet off-center composition. The red gomphrena flowers offer a nice contrast, and the baby's breath at the bottom is a gentle, volumizing filler. Tape floral foam to the bottom of the container with floral tape. Fill the container with water and dissolve a packet of floral preservative. 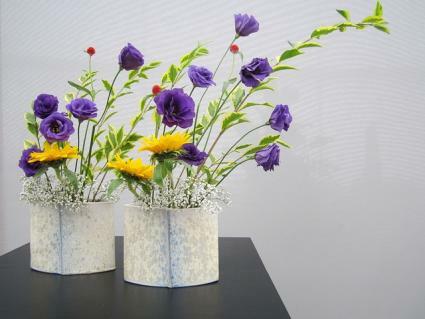 Insert the shortest stems into the floral foam first (sunflowers), followed by progressively longer stems (lisianthus and gomphrena, then variegated stems) until a balanced, spacious composition is achieved. Add the baby's breath or other filler filler plants loosely at the end. They will float in the water. 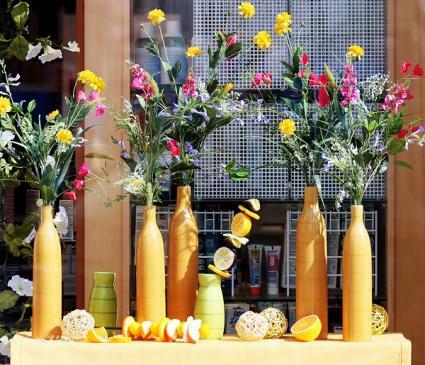 More than following any hard rules, arranging flowers should be a fun, creative project that expresses your personality. Keeping basic composition guidelines in mind, like balance, contrast, and simplicity, goes a long way toward making the best possible composition with the flowers you have on hand in the garden.